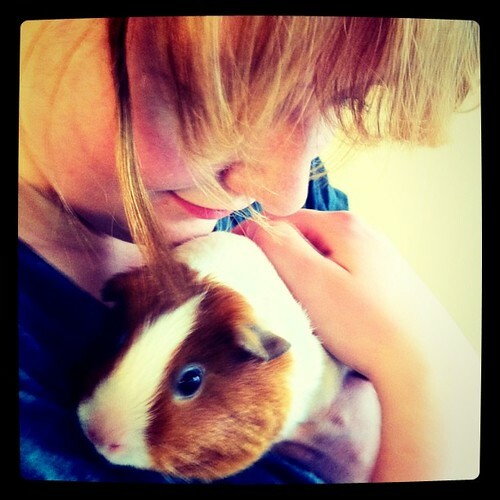 Olivia, 14, has for some time now, been wanting guinea pigs. She spent hours researching and learning about their needs and behavior. After much family discussion, we came to mutual agreement that we should adopt a pair, preferably a young female pair. Unfortunately, though there are far too many small animals in the various shelters, we had to wait a bit to find what we were looking for, and even then, it required a meeting. Taking a chance, I looked up some shelters in neighboring New Hampshire and happened on a pair in a nearby town. Friday evening we set out to round up the needed cage, food and other supplies. 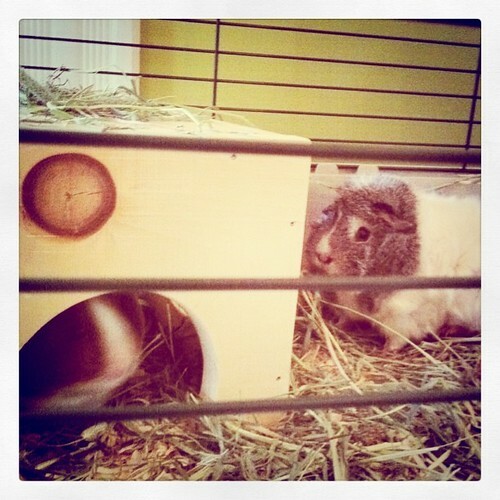 Saturday morning, Alex and Adam, 12, constructed a hiding box for the guinea pigs. With everything set up for two new friends, we made a visit to the shelter. We had our eyes on a pair featured on their website and we were crossing our fingers the whole trip that they would still be available and be a good match. I think it's fair to say it was love at first sight, at least for one of them. 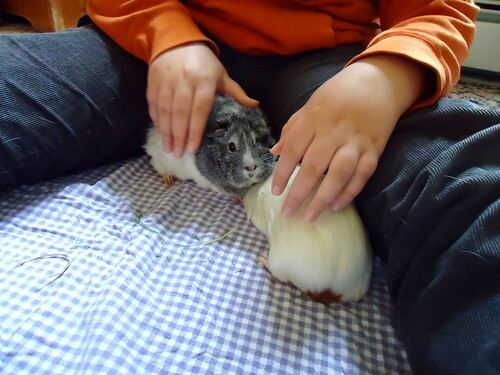 After visiting for a bit, we knew we had our pair, two 10-month old girls who had to be adopted together, which is how guinea pigs should live anyway. They had been surrendered to the shelter when their owner died and had only been there for a week. With adoption papers in order, we packed the two into the carrier (laid out with cozy towel and timothy hay, courtesy of Olivia) and we were off. Surprisingly, they made not a sound on the way home. Having always traveled with cats, this was a new and welcome experience. On our trip home, assured that the pair was indeed coming home with us, Olivia gave them their names. Annabelle has what is known as American Satin/Dutch coloring, which means she has short, sleek hair that looks and feels like satin. The Dutch coloring means she has a blaze of color, in her case ginger, on her face, broken by a span of white, with more ginger on her bottom. Her bottom has only a small bit of color, too, which just makes her cuter. She has red eyes. Beatrice is an Abyssinian, meaning her fur sticks out in a pattern of rosettes. She even has ridges of hair on her back that look like fins. Her coloring is almost Dutch, but she doesn't have any blaze on her white bottom. Her head and neck is a beautiful salt and pepper gray. She has ruby eyes. Now home, we've made every effort to settle them in comfortably. They are still shy, as they will be for awhile, until they get used to us. They've had a quick bath, just to help freshen them up since their shelter stay and so far they love dandelion greens, sweet clover, carrots and parsley. They didn't seem thrilled by the kiwi or banana. And they love their timothy hay, of course. We haven't quite figured out an exercise routine for them yet, as we're trying to let them get settled without us moving and handling them constantly. We tried some floor time, but they mostly hid, nestled up against, Adam. 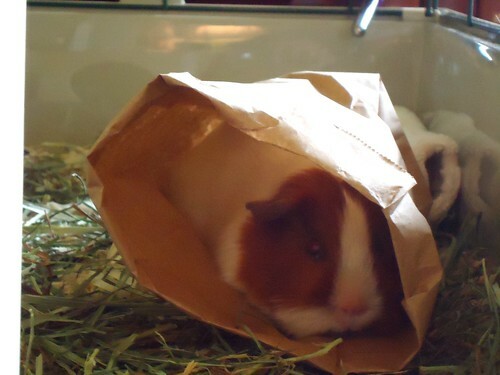 We think they might need a larger hiding box, but with the addition of a paper lunch bag, they seem pretty content. Annabelle preferring the lunch bag, and Beatrice taking the box. There is lots of rustling, moving the paper bag around, nosing it to one side or the other of the cage. Annabelle, a bit smaller than Beatrice, is able to get in the bag and turn around in it so she's facing out. The cats? 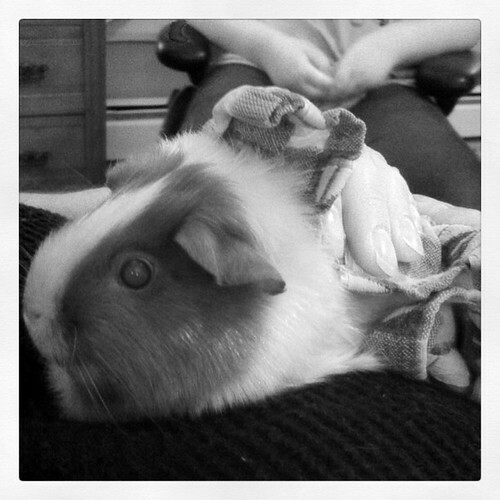 Curious, naturally, but as I predicted, mostly scared of the guinea pigs. Max is able to watch the cage now without his hair standing on end, so he's made some improvement. Ginger is happy as long as she can eat the hay. Otherwise she doesn't seem the least bit bothered by the two new residents. 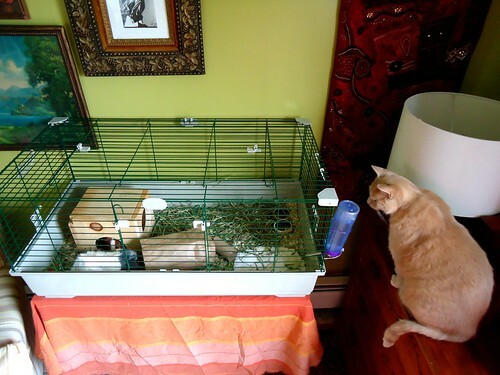 As for the guinea pigs, they seem completely unfazed by the presence of the cats. We are all adjusting to one another, they are getting to know our sounds, and we theirs. There's been lots of vibrating, purring and wheeking. We've been reading lots and learning new things. For instance, after observing that the guinea pigs rested, a lot, but never seemed to actually sleep, we learned they can sleep with their eyes open. Interesting! And weird. The most helpful resources have been Cavy Spirit and Guinea Lynx. We certainly all adore them already, we just hope, in time, that they will come to adore us as well. Aw, how fun! 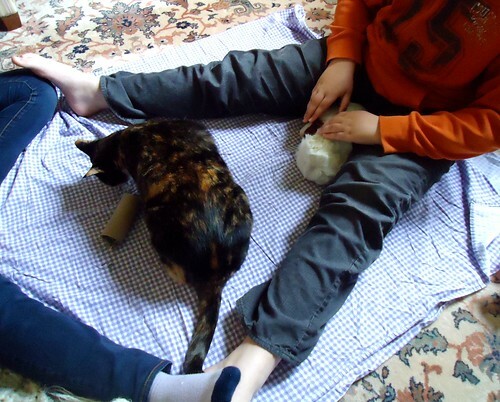 Your darker cat (with black and orange-tan) could be the TWIN of our cat! I love them! 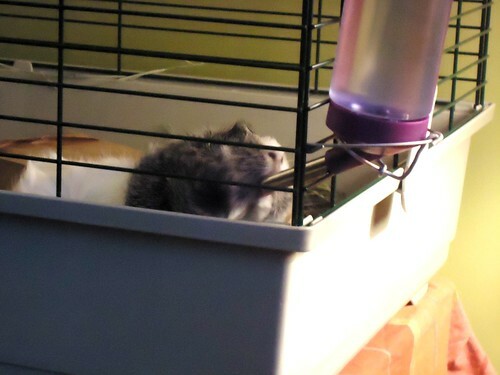 I researched guinea pigs a few years back and recall that they require a lot of space and yes, need at least one other "friend." Thank you for sharing so much information! 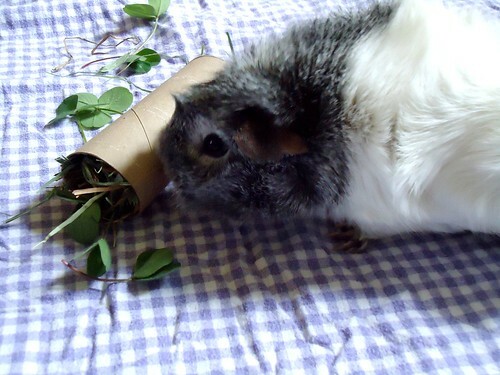 We just adopted a guinea pig from a family that is moving and this is very helpful. I love the paper bag idea, though I think our boy is a bit too big for a lunch bag!